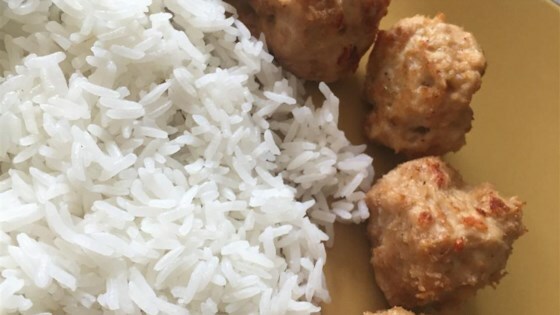 "These meatballs have a Vietnamese flair and are quite tasty! They can be served as an appetizer with a dipping sauce, or served with rice as a meal. I like them on a bed of hot jasmine long grained rice that's been cooked in a rice cooker!" In a large bowl, mix together the ground chicken, garlic, egg white, rice wine, soy sauce, Worcestershire sauce, fish sauce, sugar, salt, pepper, cornstarch and sesame oil. Form the mixture into small balls, and thread onto skewers 3 or 4 at a time. Place on a baking sheet or broiling rack. Broil for 15 to 20 minutes, turning occasionally, until cooked through. Reynolds® parchment can be used for easier cleanup/removal from the pan. Way too wet. Added bread crumbs and it just tasted like rubber. I love these meatballs! Ive made them a few times and serve them with a noodle and veggie stir fry. Easy, different and healthy.